The sun is finally out! And, we took full advantage of that! Sean and I designed and built 6 regular sized nesting boxes and 1 deluxe "brooding" nesting box this afternoon. We have been planning this addition for a while. I can't express how much I LOVE the new boxes. The ladies seem to like their new digs, too. I am hopeful that this move will increase our egg production. We'll see! Step One: We measured and cut five braces from some "reclaimed" 2x4's. 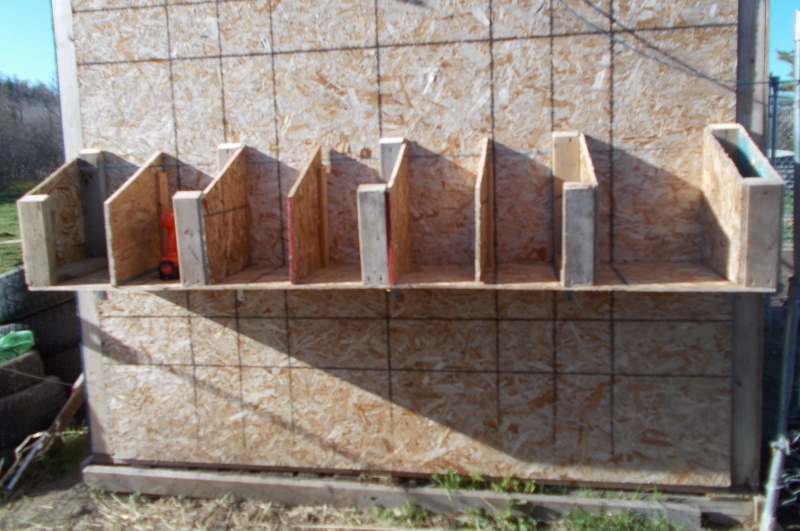 These braces were attached to a 1x8 piece of OSB on the bottom and screwed the back to the chicken coop studs. Metal brackets add extra support to the OSB from underneath. Step Two: We cut and screwed OSB dividers to the 2x4 braces. This created 6 regular sized nest box spaces and 1 larger box. (The large box is where we are planning on letting our current "broody hen" sit on some eggs in the hopes that she will hatch these.) Each nesting box measures 1x1x1.5 feet, just enough room for one hen to turn around and settle in to lay her egg. Not enough room for her to foul her nest with waste product. Step Three: Sean screwed a 1x8' OSB board to the front of the nest boxes, completing the 3rd side. 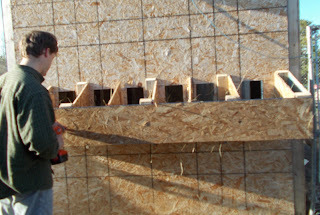 Step Four: Sean cut through the wall of the coop with his saw. He made an entry hole for each nest box. 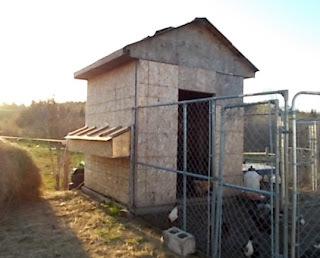 I stuffed each box with an ample supply of fresh hay so the hens would enjoy soft, comfortable nests. 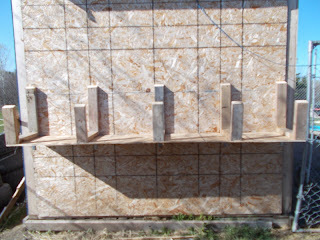 Then, we cut and attached the 1x2 foot OSB top at an angle (to help any rain or snow to run off) with 3 heavy hinges. Sean screwed a perch to studs on the inside of the chicken coop to give the hens an easy way to access their new nests. It took us a couple hours to build the boxes, but it was soooo worth it! To finish the coop, we will staple tar paper and nail asphault shingles to the roof, making it completely waterproof and warm. The exterior of the coop needs to be cedar shingled and painted. Tomorrow, the good weather is supposed to continue. After work, Sean is planning on working on the lawn mower, so I can begin tackling the lawn, while he focuses on screwing OSB sheathing to finish the stalls in the barn. It is all coming along, slowly, but surely! For now, it is time for bed. It has been another long day and I would say, we'll sleep the better for the fresh air and hard work. Cool beans! Glad she is enjoying her new spot!